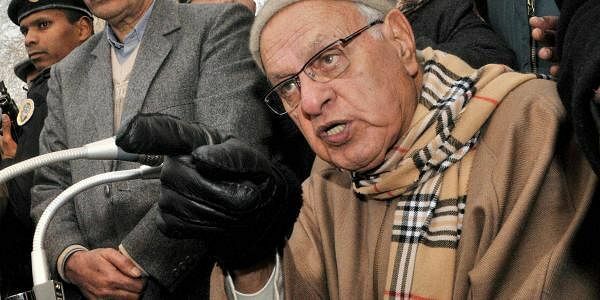 SRINAGAR: Former Union minister Farooq Abdullah on Saturday said India does not have the “power” to take Pakistan occupied Kashmir (PoK) from the neighbouring country and advocated granting autonomy to both sides of Kashmir under the existing set-up. “India does not have powers to take PoK from Pakistan and Pakistan too doesn’t have the power to take away this side of Kashmir (J&K) from us,” the 78-year-old said, while addressing National Conference supporters on 110th birth anniversary of his father Sheikh Muhammad Abdullah at Hazratbal here on Saturday. “Both countries are nuclear powers and have atom bombs. Are we going to drop these bombs on each other and get wiped out?” Abdullah said. He added that those who think borders could be redrawn need to realise the realities and dimensions of the conflict. He said there were various proposed models of resolving the Kashmir issue and his suggestion of converting the Line of Control to an international border was one such viable option.“I believe granting autonomy on both sides of the border will resolve the issue,” he said. Abdullah said the country’s first Prime Minister Jawahar Lal Nehru had proposed the autonomy idea to his Pakistan counterpart Liyaqat Ali Khan. “But he (Khan) hadn’t agreed to it”.